You might remember the exquisite tessellated lamps of Ilan Garibi. I was happy to come across one of his newest creations made as an ode to Fabergé eggs. 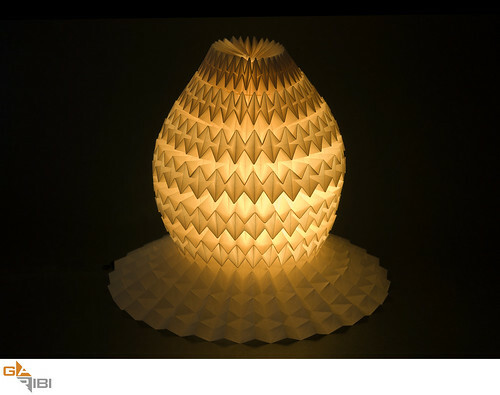 Composed of the durable and forgiving paper known as elephant hide, it was featured at a lighting and origami exhibition at Hankin Gallery in Holon, Israel this past winter. Ilan subscribes to the basic tenets of origami - no glue, no cuts, just folds and creases. Check out his delightful new website. I wish you a weekend as lovely as the lamp's glow, and if you celebrate Easter, may it be a joyous one. WOW!! !Amazing how it is just folded.Looks so perfect. What a beauty! Happy Easter weekend to you, Ann! These are SO beautiful!! its amazing what you can create out of paper! Thank you for sharing these!! Happy Easter and lots of health! Stunning lamp. Have a great weekend Ann.